When you have defined all the settings using quick add wizard or by yourself, go to Virto Silverlight Data Grid page. You will see aggregated from data sources data in a single grid view. First of all, with Virto Silverlight Data Grid you can use in-line edit mode and make edits right in the grid without any switch to another mode or view. With Virto Data Grid you can easily sort displayed items in ascending or descending order by various columns. 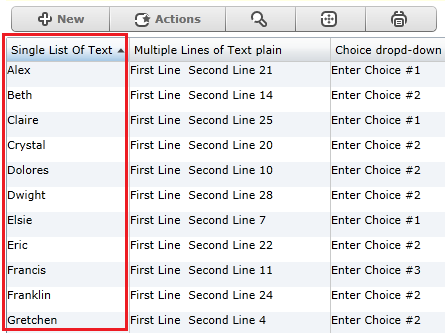 Just click once or twice on the column title (just as you do when working with Excel tables). To add new item use “New” button and fill out the Silverlight form. 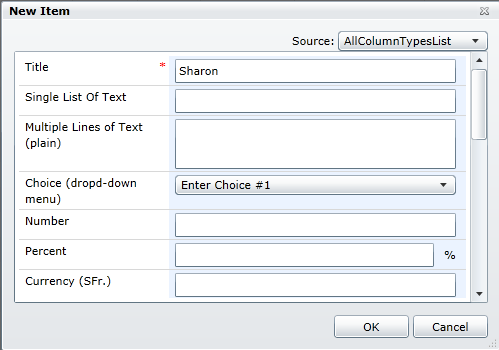 If more than one Data Source is added, select required one to add an item into it. With “Actions” menu you can view or edit an item, delete it or refresh the grid. Easy way to filter items can be used in the component. Click “Show Find and Filter Bar” to define filter for the grid. Enter a part or the whole column value to find and filter required information. To switch to full screen mode, use full screen button. To print items displayed on the page, use “Print” button.